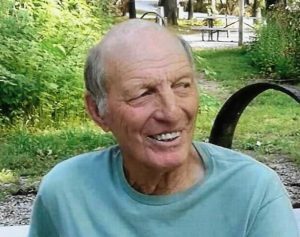 Robert Amos “Bob” Bruce was born August 28, 1939 in Harrisburg, Missouri and departed this life on May 19, 2018 at his home in Pleasant Hill, Missouri, surrounded by the love of his family, at the age of 78 years, 8 months and 21 days. He was the son of Paul Vinson and Ruby Lucille (Bradley) Bruce. Bob grew up and attended school in the Harrisburg, Missouri. Later, he moved to the Kansas City area for the employment opportunities. On April 8, 1972, Bob was united in marriage with Dianna Rae Walker in Independence, Missouri. Bob and Dianna lived in Independence for a while before moving to Belton for a short time, until Bob finished building their home in Pleasant Hill, where they have lived for the last 43 years. Bob was employed by Sellers and Marquis Roofing Company as a roofer, and was a member of the Roofers Union Local #20 for over 55 years. Among the things Bob enjoyed were, playing golf, fishing, playing cards and NASCAR. He also enjoyed watching old western movies, especially if they starred John Wayne. Bob was a good, honest, “no frills”, hard working man, who loved and was completely devoted to his family. Bob was preceded in death by his parents, Paul and Ruby Bruce; two brothers, Eddie and Raymond Lee Bruce and two sisters, Ruby Belle Cook and Dorothy Mae Simms. He is survived by his wife, Dianna Rae Bruce of the home; one son, Jerry Don Price of Tipton, Missouri; two daughters, Kammy Kay (Bruce) Holcomb and husband Rodney Allen of Fulton, Missouri, and Robin Rae (Bruce) Nading and husband Richie of Pleasant Hill, Missouri; one brother, Billy Joe Bruce of Columbia, Missouri; one sister, Dottie Ray and husband Ronnie of Harrisburg, Missouri; one sister-in-law, Loni Bruce of Columbia, Missouri; seven grandchildren, three great grandchildren, many nieces and nephews, other relatives and many, many friends. Funeral Services for Bob Bruce will be held at 11:00 a.m. Wednesday, May 23, 2018 at the Wallace Funeral Home with Rev. Tony Reynolds officiating. Casket Bearers will be Bob Shore, Richie Nading, J.R. DeLong, Cody Sublett, Alex Waterman and Austin Holcomb. Honorary Bearers are Jaylee Renee Lindsey, Brittney Waterman, Jase Allen Lindsey, Jace William Bradley and Rodney Holcomb. Burial will be in the Pleasant Hill Cemetery. The family of Bob Bruce will receive friends from 6-8 p.m. Tuesday, May 22, 2018 at the Wallace Funeral Home in Pleasant Hill.